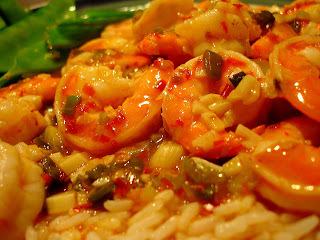 OK, so Ma Po Shrimp isn't an authentic Chinese dish, but it was my spin on one. Ma Po is a Szechuan dish consisting of tofu, minced meat (usually beef), in a spicy sauce. I made Ma Po Tofu a few weeks ago and liked it so much that I wanted to make it for Jon. He doesn't like tofu, so I decided to try it with shrimp. Jon thought this was one of the best dishes I have made for him in a while. It had a lot of heat - just how he likes it! I'm so happy that Jon loved this dish. I'll be adding it to the rotation. I served it with garlic snow peas. I heated 1 tbsp olive oil in a pan, added 2 cloves of chopped garlic, and then added the snow peas. I sauteed them for 5 minutes until tender but still slightly crispy. They were the perfect side for this dish. I love Ma Po Tofu but I've never tried to make it. I'm going to try this. So scared it will pale in comparison to the stuff I get at my favorite little chinese restaurant. :-) Looks good, though. Thanks for posting. Wowza! You weren't kidding about the heat! This was very good. Thanks! I made this tonight with chicken and LOVED it - thanks for the great recipe!